I grew up in the Pacific Northwest, known for its environmental awareness and activism in the United States. I spent years hiking with my family in the mountains, enjoying unspoiled nature in its raw beauty. From a young age, my parents taught my siblings and I to separate newspapers, bottles, plastics, and other paper into their appropriate bins (even now, I feel guilty throwing something away in the trash can when I know it could be recycled). I want to be very clear that I am supportive of effective and efficient ways to conserve. I applaud the research efforts that push the limits of creativity in order to find ways to incorporate better practices in our lives. The materialism of today's society pushes for the selfish exploitation of any resource at our disposal. One of my favourite quotes on this subject is from LDS President Gordon B. Hinckley: "I deplore waste. I deplore extravagance. I value thrift." 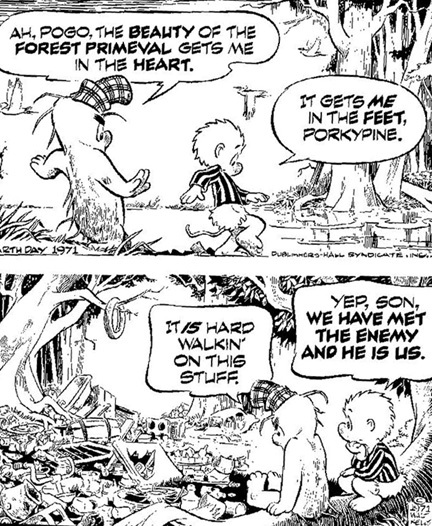 Eco-terrorism, which results in millions of dollars of damage in the name of the environment. Often targeting luxury and commercial sites, they not only make victims of the owners with no regard for human life but also fail to think of the surrounding environment (for example, the potential consequences of firing rockets at a nuclear power plant). Despite being built specifically to be green, the luxury homes of Seattle's Street of Dreams (linked above) were burnt to the ground. Some of this extremists, like James J. Lee, who took a group of people hostage at Discovery Channel, go so far as to claim that humans should stop procreating in order to restore balance in the environment. Eco-freaks, who seek to force impractical and costly practices onto the everyday user, through pressure or policy (even when the reasoning behind it is severely flawed). It's not like Americans dislike being environmentally friendly. Sometimes it's just better to choose to be so than to be forced. Ironically, the environmental issues Americans are most concerned with are the least important to the news and political agendas. In one of the above links, Nicolas D. Loris wrote that "producers and consumers do not need government mandates and subsidies to be more energy efficient. If being energy efficient saves consumers money or reduces costs for businesses, they do not need the government mandates or the taxpayers’ help." In the same vein, there are plenty of ideas out there that, if truly innovative and implemented efficiently (like paperless banking), will easily supplant our more wasteful practices. Economic prosperity does not always result in destructive environmental practices. Instead, they often have a symbiotic relationship. While we are supposed to be stewards of the earth, nature is there for our benefit. It is there for us to enjoy and preserve rather than collect and set aside. That to me is the difference between conservationism and environmentalism: the former is appreciation of and harmony with nature, and the latter is prioritization of the environment over all other issues.